In general,surgery is not needed to treat cases of plantar fasciitis. Approximately 95% of those suffering from plantar fasciitis are able live a life free from heel pain without resorting to surgery. However, your healthcare provider might deem surgery necessary if you have exhausted nonsurgical treatment options with no success. He or she may also consider it, if the heel pain is lowering your quality of life by restricting your daily activities. It is standard for doctors to first attempt nonsurgical treatment options for 6 to 8 months before even considering surgery as an option. Plantar fascia release. This is the most common procedure and involves trimming the plantar fascia ligament to release tension on the ligament relieving inflammation. The surgeon may decouple the heel bone and the plantar fascia. Alternatively he or she may make a pair of incisions on either side to release the tension. During the surgery, the doctor will make an incision above the heel pad on the foot or on the bottom of the foot. Many surgeons prefer the back of the heal because it allows you to return to walking more quickly. Additional procedures may be done at the same time as the plantar fascia release if there is a history of heel pain or additional problem in the heel such as a heel spur. Heel spurs are tiny growths of bone on the heel that can cause pain and inflammation. In the past, experts believed that heel spurs were one of the causes of plantar fasciitis. There is now new evidence that suggests that the development of heel spurs are a result, and not a cause, of plantar fasciitis. 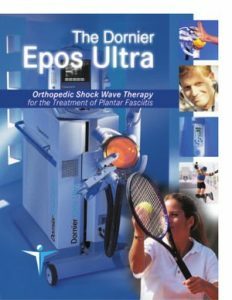 ESWT (extracorporeal shock wave therapy) is a new procedure that uses pulsating sonic waves to treat plantar fasciitis. While much research is still being completed, early studies indicate that ESWT can possibly play a role in reducing symptoms in plantar fasciitis, especially in cases that have not yet responded to other forms of treatment. Research is also underway for additional shock wave therapies. These shock wave therapies, often referred to as “focused” ESWT, may require local anesthetic. While in “radial” ESWT (a different class of shock wave treatment) the waves are more spread out and therefore can be done without anesthetic.